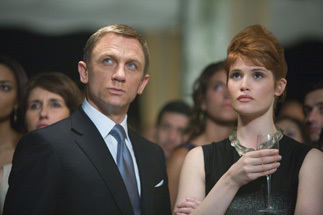 It's a big weekend at the box office, as all studios move aside for the 23rd edition of James Bond. Yes, the lone new movie release this weekend is Quantum of Solace, the MGM/Columbia co-production that marks the return of Daniel Craig as 007. Craig was the key figure in the franchise reboot, which began with Casino Royale back in 2006. Rather than keep James Bond as the suave, smarmy, gadget driven spy of the past, the studio elected to go with the brute force of Craig. While there have been plenty of heated discussions about whether the change in direction was a good choice of the series, most people seem to agree that the Bond franchise has been thoroughly refreshed thanks primarily to Craig as well as a very serious, adult approach to the story. And you can't argue with the results. Casino Royale opened to $40.8 million on November 17, 2006, giving the film the second best opening weekend overall across the James Bond franchise (the Pierce Brosnan starrer Die Another Day holds the top spot...for now with $47.1 million). It received glowing reviews (94% fresh at RottenTomatoes) and word-of-mouth, which led it to power through to $167.4 million domestically - the highest North American box office result for a 007 film to date. Needless to say, Casino Royale is extremely fondly remembered, and audiences who might have missed it in theaters have had ample time to catch up on DVD.